Here’s How On-Pack Premiums Can Help to Improve Your Brand!! Whenever a customer goes shopping, what would he or she look for? That’s right! Something creative, that can separate itself from the competition! One effective way to attract customers to your brand is through on-pack premiums! Here, we have Orion Foods. They have used an on-pack offer to promote their Custas line of products. When a customer purchases a box of Custas product, he/she will get a free packet of Toonies snack. Customer Loyalty: With on-pack offers, customers will feel that they are getting more from the company. This is because of the gift with purchase along with the product. The snack, which serves as a promotional gift offer would help to promote brand loyalty. Pester Power: An on-pack promotion effectively utilizes pester power, as children instantly spot on-pack promotions, and their childlike negotiation strategies certainly help increase the chances of a sale. Now that we understand the benefits of on-pack offers, why do we like Orion Food’s on-pack promotion? Orion Food uses its Toonies snack as the on-pack gift. 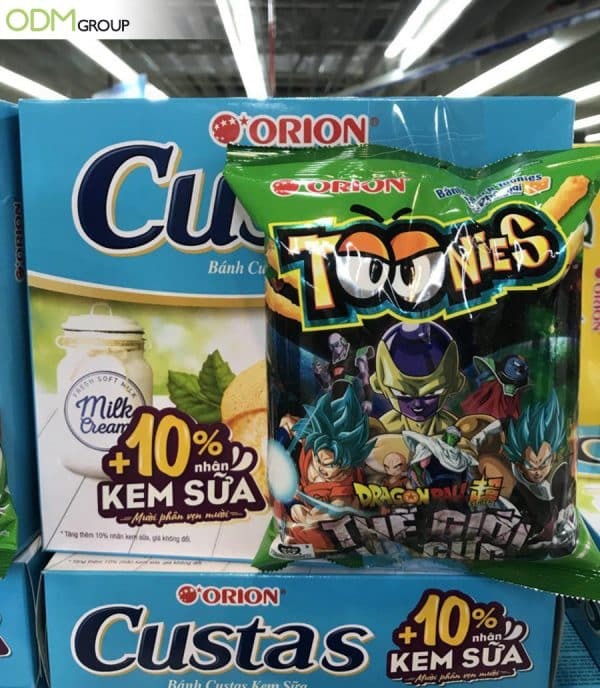 It’s Toonies snack also bears the characters of the famous cartoon Dragon Ball-Z. This would help to attract customers, especially young children, to the product, as they would immediately notice the cartoon, even from afar. The colours on the on-pack gift are also bright, which would help make the product even more visible from afar. Now that we understand more about on-pack offers, what are the important factors that you would need to take note of in an on-pack offer? The on-pack gift should be practical, so that customers are able to find a use for it, which would help to persuade them to buy the product. Having a gift with no practical use would do nothing to attract customers to your product, and could even turn them away from your product! It could also be useful if the on-pack gift complements the product that you are selling. Could on-pack offers make the difference for you? Could it help improve sales? If so, ODM can certainly help! Feel free to contact us today! We specialize in design, manufacturing, and shipping! With us, you can ensure an easy and fast process for your company! Here’s some related blogs for you to read! Here’s one for the Dragon Ball lovers! Here’s one that the kids will certainly love! Dove steps up its game with a free gift with purchase!